I can't get the wiper motor to budge????? Did it work before the re-wire? Does it have hot and ground? Is it trying to move, but something stopping it like binding linkage? If so, pull the motor, wire it up and see if it moves out of the car. If not trying to move, tap it with a small hammer in case you have a bad spot in the motor. Hope those basics shed some light. if you want i can go out and look and see whate wires i have hooked up and stuff. i still have the original wires attached to the wiper motor. That would be awesome if you would do that. I have three black wires, one green and one brown. The interesting thing is that when I connect my ohmmeter to ground, three of the wires measure .057 ohms. Wouldn't that mean that it is grounded in itself and doesn't need an external ground? I still grounded to these, but can't get it to work. I did get the brake lights to work last night!!! alright. let me go out and i will take some pics and i will have a look at it. wiring it this way you will have to turn your toggle off when it is on the down stroke so that the wipers will stop when they are down. but you will see that when you wire it. If you want them to just work then ground the brown wire then hook power to your toggle then hook your black/white wire to a toggle and you should be good to go. It does...I will attach it tonight and let you know. Thanks. One more thing...when it is off, can you move the wipers on the windshield by hand back and forth? If anyone is going to do a rewire, please buy the kit that labels the wires every couple of feet and uses the blade-type fuses. I ended up buying a new fusebox and rewiring the wire loom kit I just bought. However, it is possible to get done. Mine is done and everything works. The only problem is that I forgot to wire the license plate light so I had to fish around through lots of electrical tape and conduit to find a parking wire for it. Idiot. Ended up being fun to learn everything about the car. hey no prob man. if you have any other questions let me know. hey ben, i see you made it to florida in one piece, it you have any more trouble after your near crash ? naa i stopped in corpus christi and bought a new tow bar, and it got bent too, but other than that it was smooth sailing. Good to hear the rest of the trip was uneventfull. Bringing this thread back, because it has been such a great resource as I have planned my rewire. 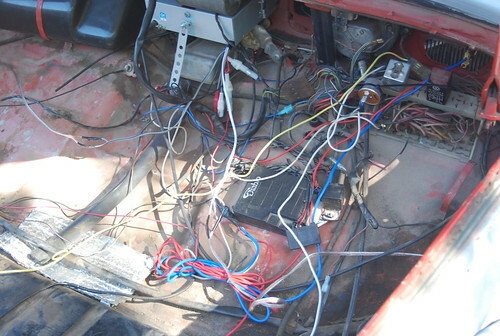 Spent today reconfiguring the new EZ Wiring Harness and stripping the old rats nest out. 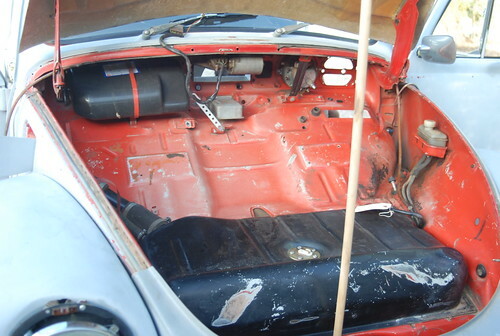 Pulled everything from front to back except for where the rear harness was encased in foam in the C pillar and the ignition and steering column plugs. I'm glad we went through with this. 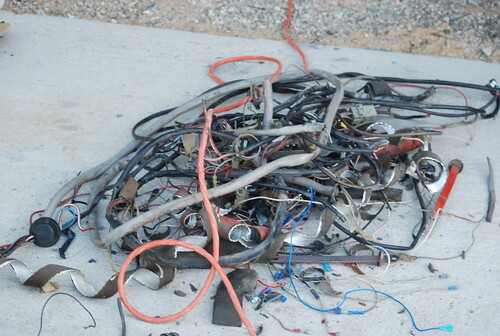 Found a bunch of sketchy wiring and fried insulation. Tomorrow we should get the harness in and hopefully everything hooked back up. We'll see if it will fire up first time! man those pics look familiar. Good to see that my rewire job was some help. If you have any questions please dont hesitate to ask. Hope that the rewire goes as well as mine did. Ive been running it...well for almost a year now i guess, and its been great. I havent had any problems. Good Luck. Ben, your write has been awesome in working on this! And since you offered, here is a question. With the alternator and being new to VW's I didn't run a wire to the tail section for the D+ terminal, but I did run the alt excitor wire in the harness back that way. Will that work to get the alt working, understanding that it won't give me an idiot light in the speedo assembly? I might be able to find that wire in the harness up front and redirect it, but I am wondering what you did there. From my research it seems like the D+ terminal acts basically as an excitor wire, but again, I'm new to the VW scene. I ended up using standard split loom for the the wiring instead of the conduit, as the conduit was too tight of a fit - might have worked for me if I gone with the 3/4" i.d. but the split loom was easier to get on anyway. We taped it closed every six inches or so before routing it through the heeter channel. I did have to do some massaging with a hammer and dremel to get a smooth pull through the original wire harness hole along the door sill prior to routing into the heater channel, but nothing major and I like that kind of problem solving. So far everything is going smoothly, though I am glad that we planned to do this over a three day weekend, have to give the wife props on that one. She has been a great help throughout this. It's nice to have someone around to get down and dirty with, or to hand you tools or a cold one!